At Alexander & Baldwin, we are Partners for Hawaii. As a diversified family of companies with its roots and headquarters in Hawaii, we offer our employees rewarding, challenging careers. We are Hawaii’s leading real estate and land company, and premier materials company and paving contractor. As we grow, so do our employees. We strive to provide opportunities for employees to grow in their roles and progress, both personally and professionally. Employees are encouraged to share their ideas and aspirations, identify areas for improvement, and increase operational efficiencies. Our goal is to foster an environment where employees can learn, demonstrate expertise, thrive when challenged, and receive recognition for their contributions. We believe that developing our employees not only impacts the success of A&B but also allows us to focus on our mission to improve Hawaii’s communities. See the job openings we currently have available. A&B is a Hawaii-focused commercial real estate company seeking an Administrative Assistant to support the daily functions and processes for our asset management department. The successful candidate will be responsible for preparing, processing and maintaining confidential materials, time-sensitive documents and detailed informational spreadsheets and schedules. Primary responsibilities are, but not limited to, assisting in the preparation of monthly, quarterly and annual reports and PowerPoint presentations, preparing memos and correspondence, and handling property management tasks. We are looking for an individual who is efficient and comfortable being a member of a team. The ability to multi-task, as well as having a familiarity with all properties and asset management terminology is a must. The ideal candidate for this job is resourceful, a good problem solver and organized. Assuring a steady completion of workload in a timely manner is key to success in this position. The candidate must possess strong skills in Microsoft Office (Word, Excel, PowerPoint) and Adobe Acrobat. The candidate must also be competent in scanning, resizing, and importing photos, maps, charts and tables into presentations. If you are a detail-oriented professional with administrative assistance experience, we encourage you to submit an application today. Alexander & Baldwin is looking for an experienced director to lead and oversee our financial reporting and technical accounting department. In this role, the director will focus on managing the internal and external financial reporting functions of the company and its subsidiaries. This individual will be a critical member of our finance team responsible for ensuring accurate and timely reporting of financial information and all technical and complex accounting policies and guidelines. The director will be responsible for the Company’s filings with the Security Exchange Commission (SEC) and will assist in ensuring highest standards of internal and disclosure controls. The ideal candidate should have a strong understanding of accounting principles and SEC filing requirements. The director will need to maintain a rigorous attention to detail and be able to efficiently maintain report accuracy while meeting tight deadlines. Advanced computer skills on MS Word, Excel and PowerPoint is required. Experience with Cognos Controller, Workiva and Express Options is preferred. A Bachelor’s Degree in Accounting, CPA license and 12+ years of accounting experience (preferably in public accounting) is a must. A&B is a Hawaii-focused commercial real estate company that values its relationships with our communities. If you want to join us in our mission in being Partners For Hawaii, we encourage you to apply today. A&B is in search of a highly-qualified Environmental Manager responsible for providing analytical and technical support covering a wide range of environmental issues. We’re looking for a detail-oriented professional with highly developed leadership qualities and the ability to work efficiently, independently, and within budget. This individual will assist in overseeing site investigations, planning and management of environmental response actions, and building demolition and renovation projects, including hazardous materials identification and abatement. This individual must have broad familiarity with federal, state, and local environmental regulations, have the ability to analyze and assess their applicability to Company operations, be capable of ensuring environmental compliance and identifying and addressing potential environmental concerns in a timely manner. The candidate will collaborate with all departments to optimize employee awareness and training in environmental issues. The right candidate will have a college degree in environmental science, chemistry, engineering, or closely related disciplines, as well as at least 10 years of postgraduate experience in environmental regulatory compliance and/or oversight of environmental site investigations and remediation. Training and state certification in one or more asbestos and lead inspection/risk assessment disciplines is desired. A&B is currently looking for a professional and responsible individual to fill the role of Property Manager for our Oahu commercial real estate portfolio. The Property Manager will have the full responsibility of managing daily operations, as well as being on-call for 24 hour emergency responses. The ideal candidate will be accountable for ensuring the optimum operational and financial performance of the property, including collections, tenant services, maintenance, revenue enhancing and other capital improvements, contracted services, administration and reporting, and safety and legal compliance. A Bachelor’s Degree, Hawaii Real Estate license and CSM/CPM certification are preferred, as well as at least 3 years of shopping center property management. Microsoft Office skills is required and JD Edwards software skills is preferred. 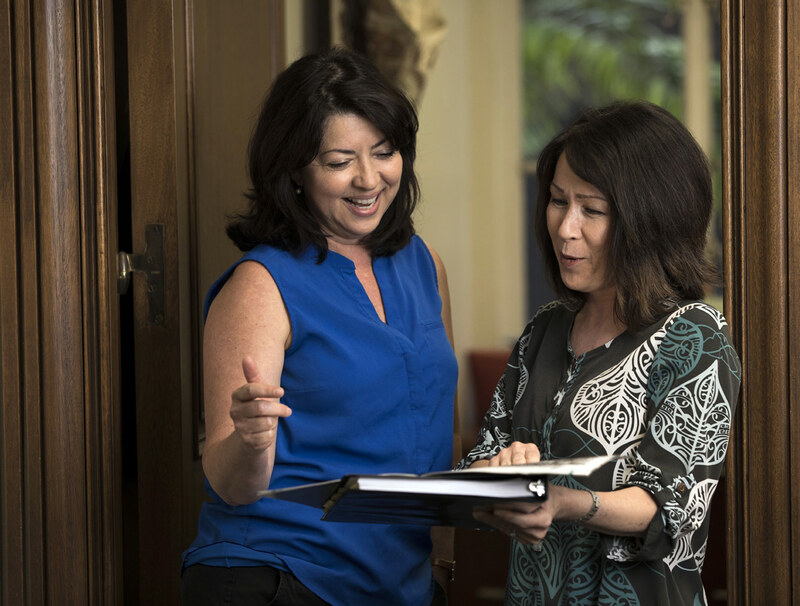 A&B is looking for a dedicated Receptionist/Office Clerk in our Honolulu office to handle administrative support across the organization, and greet and welcome guests who visit the building. The ideal candidate will coordinate front-desk activities, including distributing correspondence, redirecting phone calls and other duties as assigned. When our guests walk into our office, we want them to find a friendly, smiling face and a helping hand. The ideal candidate has excellent communication and multitasking skills, a positive attitude and a strong work ethic. Additionally, the successful applicant should be proficient with Microsoft Office. The receptionist is one of the main faces of our organization. If you have good people and communication skills, we encourage you to apply today. A&B is an equal opportunity employer and makes employment decisions on the basis of merit and business need. We want to have the best-qualified person in every job. A&B policy and our Code of Conduct prohibit unlawful discrimination based on race, color, gender, religion, age, marital status, national origin or ancestry, physical or mental disability, medical condition, sexual orientation, citizenship, ethnicity, military or veteran status, and any other consideration made unlawful by applicable federal, state, or local law. A&B is committed to working with and providing reasonable accommodation to individuals with disabilities pursuant to the Americans with Disabilities Act. Applicants who would like to request a reasonable accommodation for any part of the recruiting process due to a medical condition or disability should call (808) 525-6611 and let us know the nature of your request and your contact information. Employees who need a reasonable accommodation are encouraged to speak with their supervisor or Human Resources.